Having focused his production to prototypes and high technological level, fima was looking for an electrical machine tester able to satisfy both requirements. Because of its flexibility ATG A7 matches these needs. Its Speed, a big tester area, multiple parallel loading, and its already known precision make of this machine the right choice for the development of its electrical test department. Also this year Fima took part at “Electronica“, the 28th International Trade Fair for Electronic Components, Systems and Applications, in Munich, Germany. Fima has shown all the new investments made this year. They have been focused on increasing quality, productivity and technology. In order to increase the AOI department throughput, fima decided to increase its available machine number buying an Orbotech AOI of Fusion series. Fusion is able to inspect a panel using multiple light sources only in one scan for unparalleled detection accuracy. Designed for high-end HDI and MLB applications, Fusion matches exactly fima's technological requirements. Taking evident advantage from its continuous investments process, Fima decided to improve its printing department, inserting in the production flow a new direct imaging machine. It is an APOLLON of Printprocess company. Its versatility gives Fima the possibility to print solder mask as well as inner layers or outer layers with a very high precision. The simple tooling and the automatic loader and unloader increase significantly Fima's productivity in this fundamental department. Fima keeps improving with its latest investment: the new Double Plugging Machine represents another step forward in PCB manufacturing, with an innovative hole plugging process. Fima is now capable to apply conductive and non-conductive paste with a special designed process that makes it possible to avoid the formation of air bubbles in the holes. A whole new level of working is also granted thanks to the 5kg capacity of the storage container. The possibility to work on both stations simultaneously although using two different programs, ensuring high quality even without renouncing to high speed production. In the perspective of improving the galvanic processes and assuring working continuity Fima decided to implement a new galvanic system. Its total automation, the vibration systems and the floating bars are just some of the peculiarities that mark this machinery, that assures also a special consideration to the operator's safety: Caoduro Galvanic System pays in fact particular attention to the surrounding working environment. In order to optimize its productive process Fima focused on an aspect that is too often considered of secondary importance, logistics. That is the reason why a new automatic magazine has been implemented: Fast, accurate and practical, the new Vertimag Bertello has significantly affected the production timing, simplifying the stocking of laminated base materials. Fima never stops its investments. 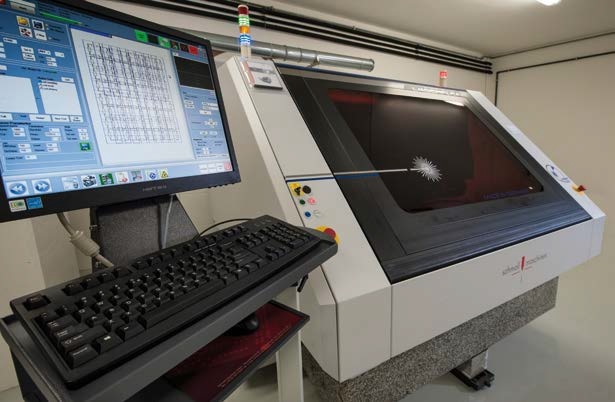 Thanks to a recently installed milling machine, it is now possible to mill PCBs with automatic alignment driven by a CCD camera: this way FIMA guarantees to satisfy tightest dimensional tolerances. This equipment makes it also possible to carry out Z-axis controlled counterbores with a still unbeaten precision of +/-10 μm. Innovation, advanced technology and focused investments play today a key role in the strategy of each company. Fima considers them as a base to assure a smart organization that satisfies the requirements of an innovative market . In this strategy Fima has achieved a significant result by purchasing the new LASER DRILL MACHINE, so improving its competitive value in the production’s capability of high technology PCB’s. A little step in our strategy a great step in your technology. Beside our green solder mask line, a second air spray machine is available to deposit colored solder masks: with three different guns and three separated hydraulic circuits , this equipment allows us to spray colored solder mask (white, black, red, blue, yellow …) without interfering with the normal production. Even when the world economy proves itself far from favourable, Fima perseveres in its step forward in investment and innovation by paying due attention to aspects often wrongly considered less important. With great satisfaction we disclose that ECOVADIS and SCHNEIDER acknowledged that Fima works in respect of the policy ISO 26000:2010 on the Social Resposability of the Organizations (Environment, Safe working practices, Fair trade practices, Sustainability). For the second time the french international group SCHNEIDER Electric officially recognized Fima as the best supplier of the year. This feedback is based on quality, timing and efficiency in communication. Our quality system daily puts its efforts to satisfy our customers’ requests. FIMA is very proud to receive this reward in a competition where also bigger and internationally renowned companies take place. FIMA is a perfect demonstration that the dimensions of a company are not directly proportional to its technological and qualitative efficiency. Since this year Fima has decided to use the new regulatory instruments to combine education and work. Fima gives high-school graduates with a technical education or experience the opportunity to join our team. The possibility to work in Fima allows young students with no or little working experience to get familiar with the dynamics of an industrial productive reality, which is becoming increasingly international. fima at electronica 2014 Fima took part at the 26th International Trade Fair for Electronic Components, Systems and Applications last November 2014, in Munich, Germany. Even in this edition Fima showed its experience to players from all over Europe. Our company is able to combine high quality products, technology and flexibility thanks to its relatively small dimensions.